This post is a continuation the main article on Dances's Square, Crescent and Circus which give an overview and sets the context of this series of posts. Posts on the neighbouring locations of America Square and the Circus are also part of this series. The Crescent was the second part of Dance's plans for Vine Street. 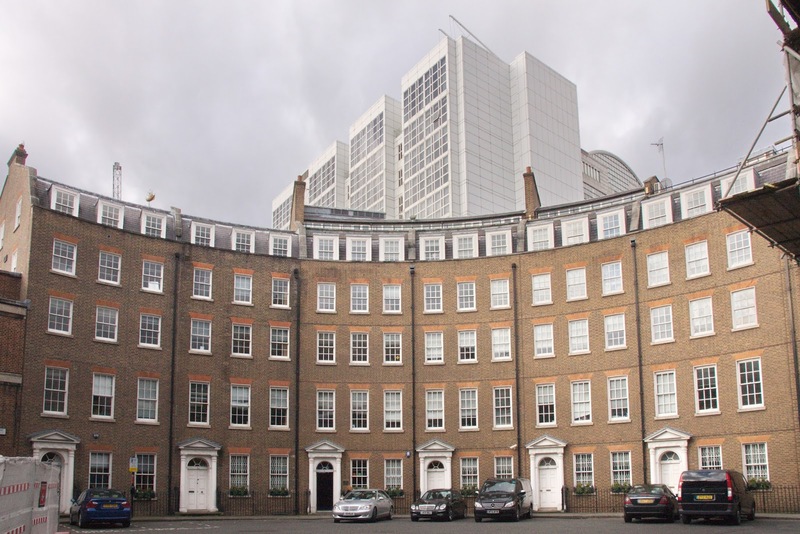 Built at the same time as America Square and the Circus, this was the first planned crescent in London and introduced the concept of curved street frontages to London. Thought to have been influenced by the work of John Woods the Elder's 'Circus' in Bath, Somerset, which was started in 1754. Dance's crescent was actually built at the same time as John Woods the Younger's much grander Royal Crescent in Bath between 1767-1774. The Crescent was originally formed of 11 identical, each of four storeys and three bays, plus cellars, and featuring ornate door cases in a more decorative design than those in America Square. Like its neighbour America Square, the development of the railways in the 19th century had a major impact on the The Crescent. First the Fenchurch viaduct separated it from its afore mentioned neighbour in 1841. Secondly in 1884, the Metropolitan district railway (Circle and District Line) sliced through The Crescent in a south-west to north-east diagonal. 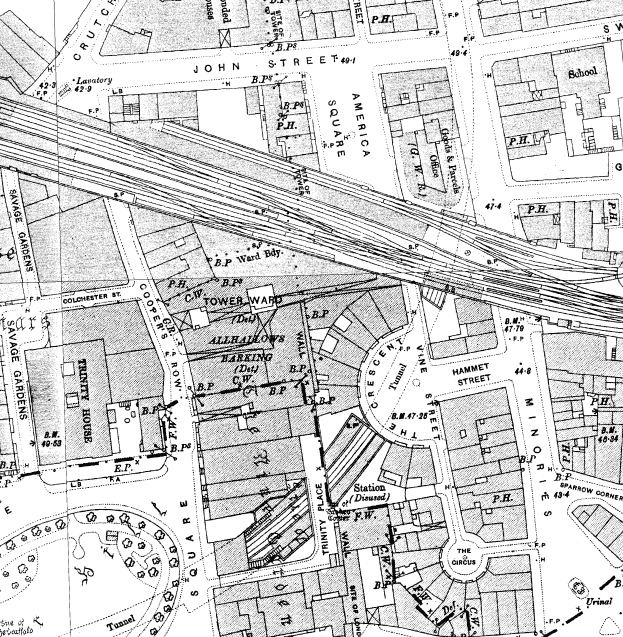 Due to the 'cut and fill' method of construction of this new sub-surface railway, it necessitated the demolition of houses numbers 3-5 as it sliced though The Crescent as can clearly be seen in this section of the Ordnance Survey map of 1915. An unsightly electricity sub-station, was built over the underground railway platforms in the 1930s to fill the gap left by the missing houses and survives to this day. The Crescent area suffered large scale damage from bombing in 1941 during the Blitz period of World War II as shown below which verifies the detail of the bomb-site map in the leading article of this series. 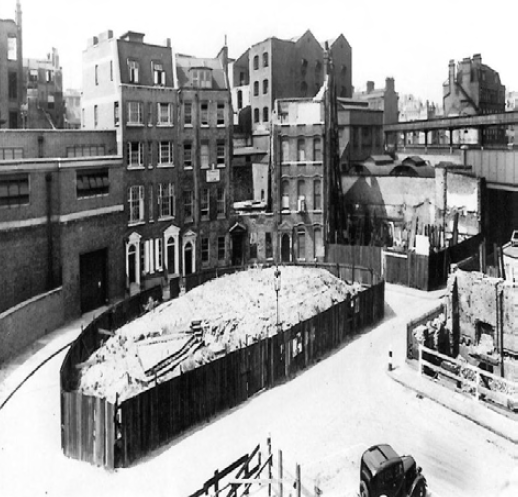 The 1930s electricity sub-station seems to have survived the bombing well as seen on the left in the photograph, along with houses No.6 and 7, but the other houses, Nos. 8-11, suffered either total or major destruction. Other buildings which lined Vine Street and Hammett Street seen in the bottom and right corner were also completely destroyed during this period. The Crescent showing bomb damage c.1941. Taken facing North-West. Post war, the remaining houses were individually repaired or reconstructed, and finally in the late 1980's a programme of restoration was completed by architects Lyons, Sleeman and Hoare, which included the building of replica houses at Nos. 8 to 11 constructed to the original unified Georgian design. The Crescent in 2014. No. 6 and 7 on the left are original, and Nos 8-11 being the 1990's reconstructions. Today Nos. 6 and 7 retain their original door cases, and the reconstructed houses of No's 8 to 11 pictured below have carefully crafted reproductions. Original Georgian door case to No.6 The Crescent. The rear of the houses in The Crescent are not so uniform, reflecting the earlier ad-hoc rebuilding after the war. 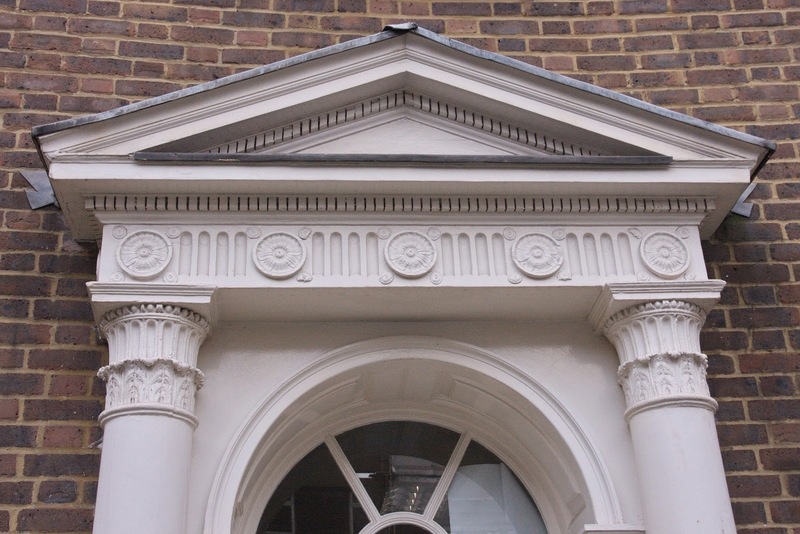 Mostly neo-georgian and finished in London stock brick to various designs, No.7 on the right of the photograph has a most interesting pedimented gable end with classical Corinthian capitals atop fluted pilasters. The rear of the Crescent also backs to one of the largest remaining sections of the London city wall known as Cooper's Row which was featured in a previous post to which this mini-series is related. 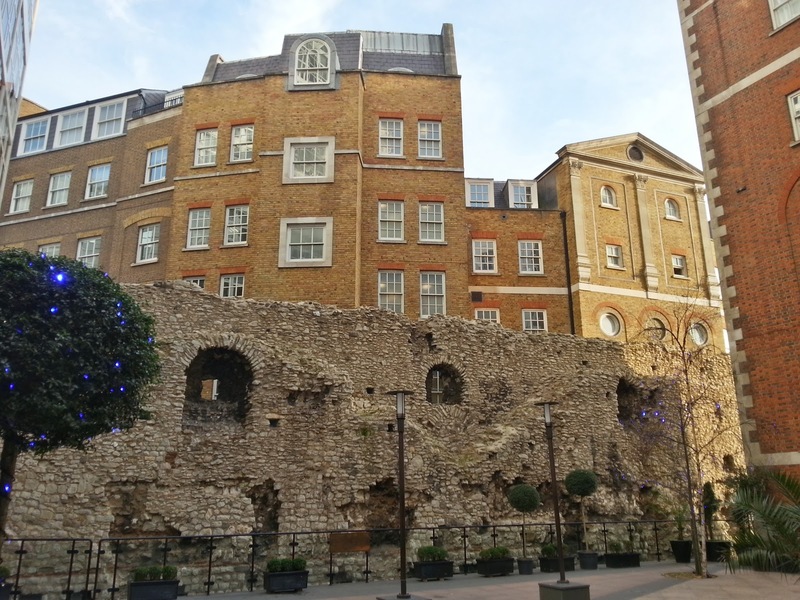 Rear of buildings of The Crescent, with remains of the London city wall known as Cooper's Row in the foreground. As mentioned in the lead article in this series, The Crescent is now part of a dedicated conservation area which includes the space to the south formerly occupied by the Circus. The aim of the conservation area is to protect and enhance the current space and ensure future developments do no more harm to the identity of the area. As part of the Aldgate Improvement Project there are plans to add more green space to the area, and the Crescent may benefit from this proposal, with an emphasis put on improving pedestrian access along Vine Street and restoring the continuation of Vine Street south to the Circus again. 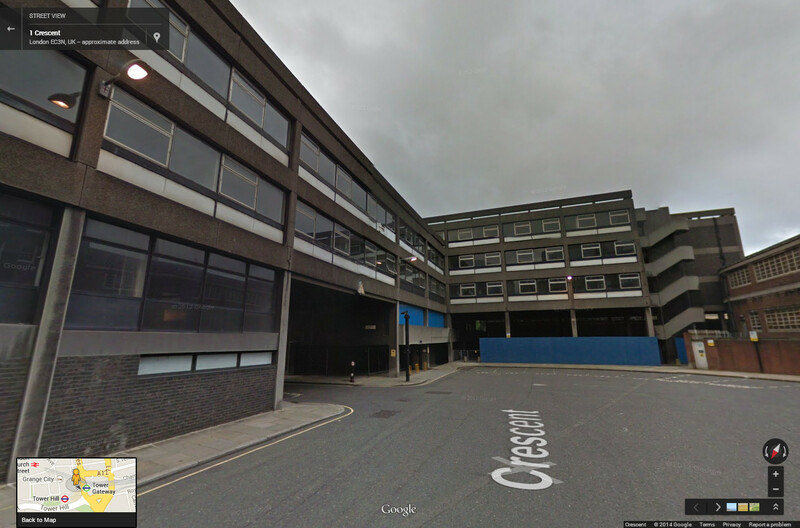 The building currently at the end of Vine Street in 2013/4 is known as 100 The Minories. 100 Minories in 2013, formerly part of the London Metropolitan University. 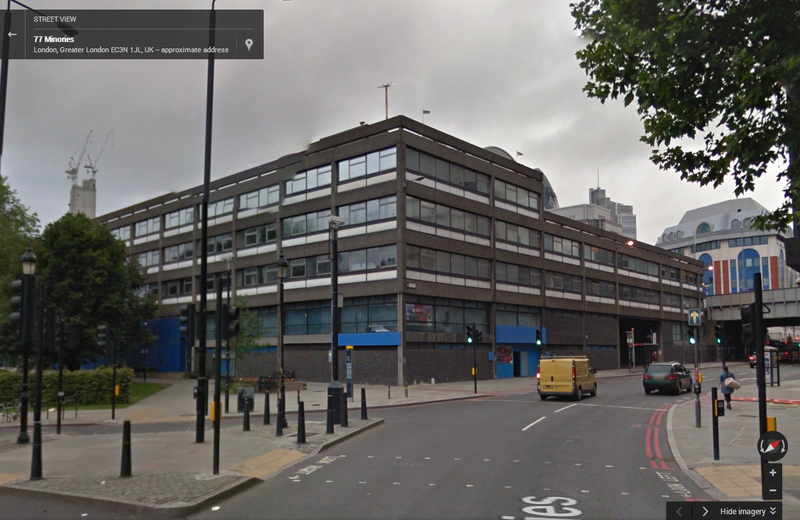 It has been lying empty since 2011 having been vacated by the London Metropolitan University. 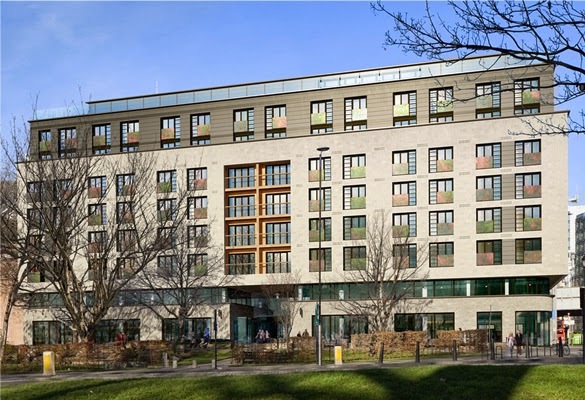 It was originally designed by Sir Hubert Bennett and Michael Powell, and built in the late 1960's for the newly merged Sir John Cass Department of Navigation and King Edward VII Nautical College. Picture taken from The Crescent looking due south. 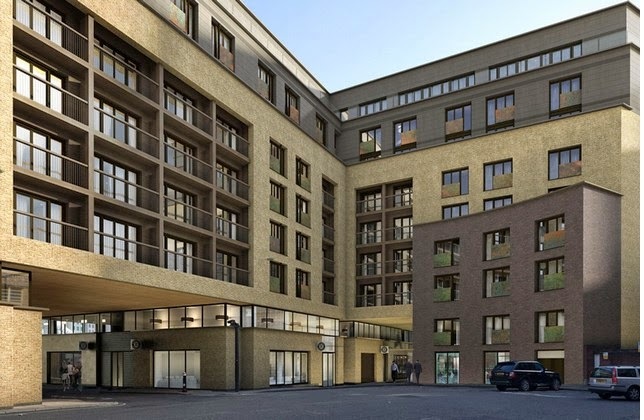 At the time this article was posted, this building is just about to under go demolition to make way for a new 268 room hotel complex, with two basements, ground floor and eight upper stories designed by Buchanan Hartley Architects. The significance of the hotel is that it's L-shaped footprint will surround The Crescent as does the present 1960's building. There were objections to the original plan for the hotel in relation to it's lack of empathy to the historic buildings of The Crescent, but I am not certain what revisions have been made or if indeed the pressure by the developers outweighed any objections. Proposed rear of new hotel facing into The Crescent. As can be seen in the artist rendering above, the proposed rear of the hotel is to be clad in traditional London stock brick and includes a curved four story element to be faced in contrasting brickwork to match the Georgian buildings and the historic curve and facade height of the original houses of the Crescent. There were also proposals for a "screen" to mask the unsightly 1930's electricity sub-station, which may have been abandoned. Artist rendering of southern elevation for proposed hotel at 100 Minories. As part of the new development the Vine Street passageway linking The Crescent to the Circus would be recreated to match its historic alignment and width. Commute is the brainchild of Leo Hills and Tony Inns. Between them they have 40 years experience in the transportation industry with the help of bestessay.com and in combining their expertise they can offer their clients a more personalized, collaborative and pragmatic approach to finding transport solutions.